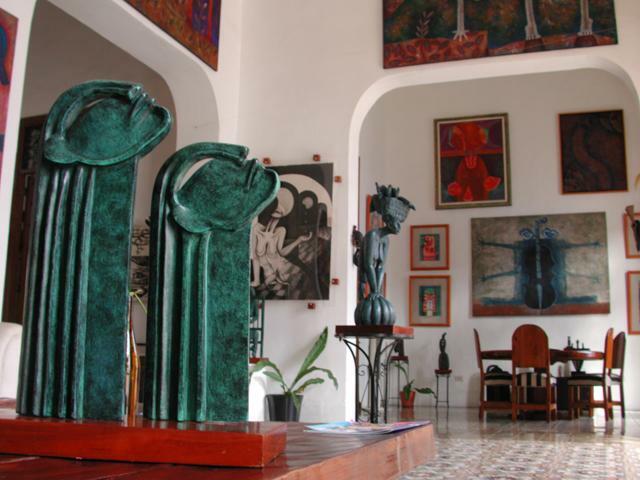 A different experience in Mérida: you can witness art the way the Vázquez Medina family lives it every day, united by sculpture and painting, together with photography and fashion design. Going inside Galería Nahualli is to be part of these unique artists’ home and even participate in the creation of their work. What do you think? Art is a very personal way of expression that responds to artists’ concerns and experiences, their talents and abilities to express themselves in a visual, written, or musical work. 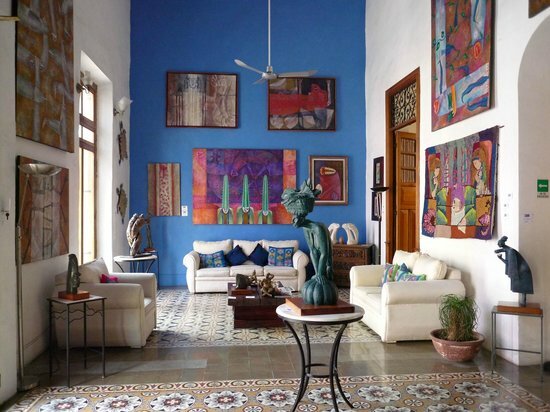 In the case of Melva Medina and Abel Vázquez, the couple that owns this home gallery, they are a perfect artistic pairing that expresses itself in drawings, sculptures, and paintings of different techniques, always surprising the spectator with their colorfulness and originality, but also with the impact that the works make. The house that hosts the gallery deserves a special mention: it’s a colonial mansion located in the “barrio” of Santa Ana, restored with high ceilings and pasta tile floors. It offers relaxing spaces cohabited by the works of art, their own and by other artists, that you can appreciate in the rooms and throughout the entrance area. Of course, all of the art is available for purchase. But the most interesting part is that it functions also as a home, so if you are lucky you will be able to have a coffee with this artist couple, watch them while they create a sculpture or painting, or simply chat with them about their work. We guarantee that talking with Melva will be a unique and unforgettable experience from your visit to Mérida. Each piece is a display of talent, creativity and expression, whether you are a connoisseur or connecting with art for the ×rst time. An example of artistic expression – but also of protest – was the multidisciplinary project “Presas del Silencio” (the prey of silence) presented at the Museo de la Ciudad de Mérida during the winter 2016 edition of Noche Blanca, now planned to be exhibited in México City. The result of a year and a half of research and work with safe houses for girls and women who have suffered from abuse and violence, both Aura Meztli, fashion designer and daughter of this talented couple, and the sculptor Melva Medina, are looking to defend the role of women in the face of these problems. In a collaborative approach, Aura created 12 unique out×ts in white and red, projected as a tool that gives power and security to women. Meanwhile, Melva translated these experiences into large and forceful sculptures; both with the constant support of Abel and Citlalli, the youngest daughter, with photography and branding. This is how art becomes a collaboration vehicle among the members of a family, a movement also of protest and reflection, and an excellent example of spaces open to new collectives and ideas. A must during your visit to Mérida!